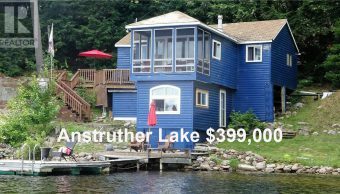 Anstruther Lake is a lake in the township of North Kawartha, Peterborough County, Ontario, Canada, between the community of Apsley on Ontario Highway 28 8.5 kilometres (5.3 mi) to the east and the community of Catchacoma on Ontario Highway 507 8.5 kilometres (5.3 mi) to the west. Kawartha Highlands Provincial Park encompasses the lake, and the community of Anstruther Lake is on the southern shore. The lake flows out via Anstruther Creek, and the Mississaugua, Otonabee and Trent rivers into Lake Ontario. Approximately 230 cottages have been built on the lake. Partial road access. 25 town houses were recently built at The Landing marina. Fishing is reportedly good, though not as good as the uninhabited lakes upstream. The Anstruther Lake Cottager’s Association hosts an annual regatta (Civic Holiday) and corn roast (Labour Day). There is a Marina is on this lake to provide gas, boat services and necessities. Anstruther Lake is found not far off Highway #28 north of Lakefield. Just south of Apsley off Highway #28, Anstruther Lake Road leads west. Follow Anstruther Lake Road all the way to the public access along the east side of the lake. Bass can be found in any of the quiet bays around the lake. The lake is also home to a naturally reproducing strain of lake trout. These lakers have been fished heavily in the past but the increased use of catch and release helped maintain the current lake trout populations.